“We’re laser-focused on CLR 131, without question,” Caruso says in an interview at Cellectar’s offices in Madison. 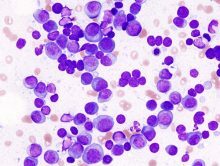 The drug candidate, which has the potential to treat malignant tumors and certain forms of blood cancer, including multiple myeloma, is currently in a Phase 1 clinical trial. Cellectar’s technology is based in part on phospholipid ethers, which are designed to help kill tumors while minimizing the amount of healthy tissue destroyed in the process. The company was co-founded in 2002 by Jamey Weichert, a radiology professor at the University of Wisconsin-Madison. Weichert, who was Cellectar’s chief scientific officer, left the company in July. Weichert’s exit was sandwiched between the departures of two other key leaders at Cellectar in 2016. Former vice president of business development J. Patrick Genn’s last day was March 11, according to a proxy statement from the company, and former chief medical officer Kevin Kozak left last fall. Caruso confirmed both departures, and says that Cellectar currently has 15 employees. But in the time since Caruso came aboard, in June 2015, his company has had occasional good news to report. Cellectar has made strides on the intellectual property front. And in August, the National Cancer Institute awarded the company a $2 million grant for the Phase 2 clinical trial of CLR 131. Caruso says his company is “really excited” with the results it has seen from the drug’s Phase 1 trial up to this point. Cellectar views the responses of four patients among the eight that made up the study’s first two cohorts as more favorable than the other four patients’ responses, he says. Every one of what Caruso calls the four “best” patients in the first two cohorts met the threshold of partial response, the marker of efficacy in a clinical trial, within 85 days of being dosed with CLR 131, according to company materials. Caruso says he believes the data could look even better on patients in the third cohort of the Phase 1 trial, which is currently enrolled. There is also the possibility that administering multiple doses of the drug over time could produce better results, Caruso says. In the Phase 2 study, investigators will have the option of giving patients a second dose between 75 and 180 days after the first one, he says.